Yesterday I noticed that my stems have really grown! 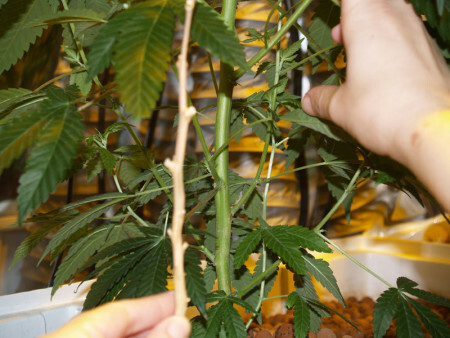 Above is a picture of my skinniest stalk that I am holding up to the dried stalk from my “second grow”. For more about the dried out stem from my “second unofficial grow” read my post Learning to Grow Marijuana. 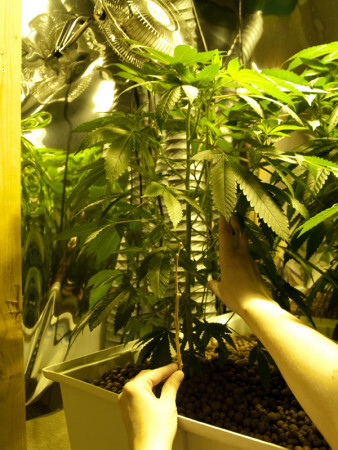 The stems have at least tripled in width during the first week of flowering. I think it is because I was using very low lumen producing T-12 lights and then switched to a very high lumen producing 400 watt high pressure sodium light. It has really made a difference and I am glad that my investments are paying off. Here is another picture that shows only half of one of my plants. So far this grow is already twice the size of my last!